The Gemini offshore wind park in the Dutch North Sea, located 85 km north of the Dutch coast, is to be one of the world’s largest wind farms, both in terms of size as well as production (total capacity of 600 MW). Gemini is being built on two locations close to each other, ‘Buitengaats’ and ‘ZeeEnergie’. EWE Offshore Service & Solutions GmbH (EWE-OSS), the offshore subsidiary of the Oldenburg-based energy provider, will be in charge of operating, maintaining and monitoring two transformer stations at sea and one transformer station in Eemshaven. It will also be responsible for the network management of the two 220 kV export cables that will transport the electricity to land and a 380 kV stretch of cable on land that will connect the electricity to the transmission network. 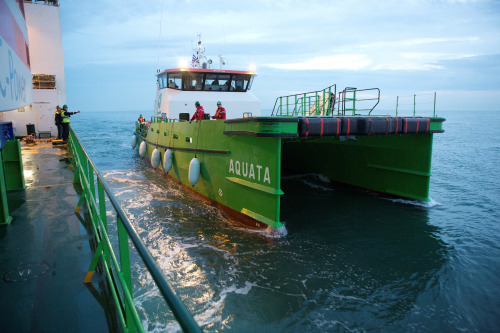 “OWA has quite some experience in offshore maintenance activities on the North Sea and can count on the longstanding expertise of parent company GeoSea and other offshore companies within the DEME Group. It allows us to export our maintenance know-how on a long-term basis on the entire European energy market,” confirms Stijn Delauré, General Manager Offshore & Wind Assistance NV.